Dr. Frost became a professor in psychology at an early age. He is extremely bright but has difficulties sympathizing and connecting with others due to an injury to his frontal lobe as a child. During the day he works as a counselor at a University counseling center, and at night he works as a bartender. Dr. Frost begins to work with a new teaching assistant, Yoon Sung Ah, at the counseling center. Yoon Sung Ah is enthusiastic with the clients needing counseling and does not struggle with connecting with others. The two of them work together to solve problems of the people who go to them for help. ~~ Based on Lee Jong Bum's webtoon "Dr. Frost". I personally liked it. 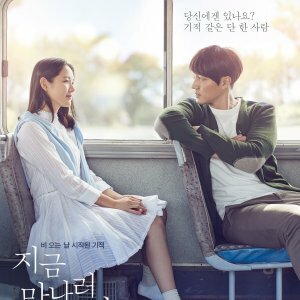 I have only read chap.1 of the webtoon (b/c I am not someone who reads webtoons) before I started watching this drama, so I can't compare the two. But I thought the drama was made really well and the entire cast did a stellar job. Story: About a man called Frost who due to an accident when young lost most of his emotions and had his hair turned white. He and his team of "buddies" solve cases dealing with psychology. Every episode deals with a different case - but there is one underlying case involving Frost that starts showing itself mid-way. 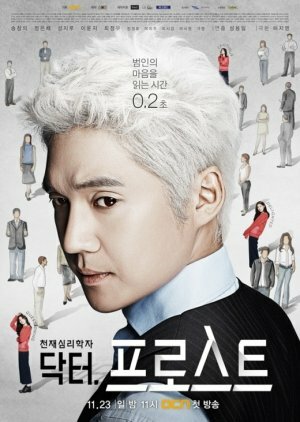 Cast: Dr.Frost (Song Chang Eui) This is the first drama I am recognizing him in and I think he did a great job, he's attractive even with the 'white' hair ;) His very rational and thought processing mind was very believable. I liked how I could see the puzzle pieces come together in his eyes. I wouldn't mind working for him myself^^. Yoon Seung Ah (Jung Eun Chae) First time I've seen this actress too, I liked her as the novice apprentice who has a totally different character than Frost - they worked well together. Cheon Sang Won (Choi Jung Woo) was great as the head professor. (I always enjoy seeing this actor in dramas). Song Sun (Lee Yoon Ji) at first I didn't like her b/c of her animosity towards Frost but about half-way in the drama, she stopped acting rude and was then pleasant to watch ;) Nam Tae Bong (Sung Ji Ru) I loved him as the Detective - always bringing new cases for Frost to help solve, he made the drama even better by being there. All the supporting and guest characters did a good job. Music: It was good and suspenseful at times but I don't remember any actual songs. Re-watch Value: 5.5 - If I get hungry for some psychological stuff again I may re-watch a couple episodes here and there. I never watched the webtoon, so I have no idea how the drama relates to it. This review is solely based on watching the drama. It is a nice light psychological thriller. It isn't really suspenseful. There is no major action, no romance, no emotional revelations, no real character development. However, it is interesting if you like psychology which I do. The main story line is tied together neatly with the weekly "who done it" story line. I enjoyed it, but I kind of had it figured out about mid way through the drama. I have seen better psychological dramas. The acting is fine. Nothing stands out. I have seen Song Chang Eui do better. I am a huge fan of Sung Ji Ru and he excels as Detective Nam. If you like psychological dramas, then there are better choices, but this one is ok.